then transfer to Reykjavik Bus Terminal with Flybus in around 1 hour. In 15 minutes walking to B47 Hostel (double room with shared bathroom - 175 EUR for 2 nights). 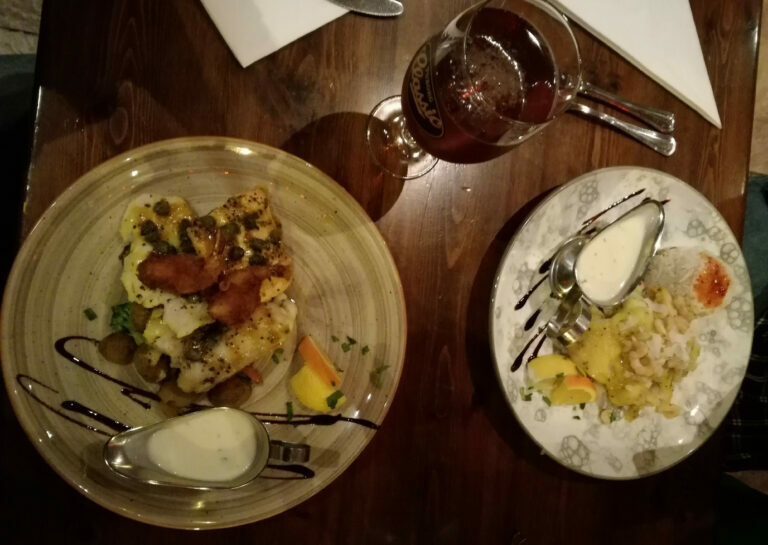 Because of Christmas Eve it is not so easy to find a restaurant, finally having a Chicken Haloumi Pizza and Fish & Chips at Durum (together with a Pepsi for almost 50 EUR - including free drinking water). Having a walk back to the accommodation with a short stop at Hallkrimskirkja. and having breakfast again at Durum with a plate of rumbled eggs, beans, sausages and bread, banana-mango-orange juice and coffee for approximately 30 EUR. Daylight begins to approach. Sunrise at this time of the year is around 11:30 and sunset around 15:30. Another visit to Hallkrimskirkja. Usually it is possible to climb it up - the view is supposed to be spectacular. However, on 25th there is only a Christmas ceremony and no access to the top. Walking down the Skólavörðustígur with its shops to Harpa concert hall and the old harbour. Having coffee at Cafe Haiti. Two coffees and two muffins for nearly 20 EUR. 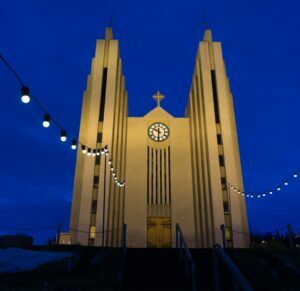 From there via Dómkirkja Krists Konungs church towards Reykjavík City Hall. 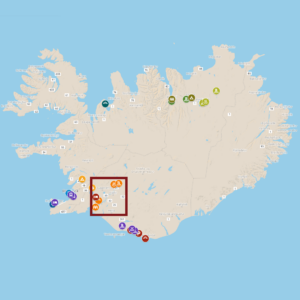 With public bus number 14 (3.50 EUR one way) approximately 15 minutes to Hofgarðar station and from there a 20 minutes walk to the Grotta Lighthouse. Beautiful views, but weather starts to become raining and very windy on the walk back to the bus station. 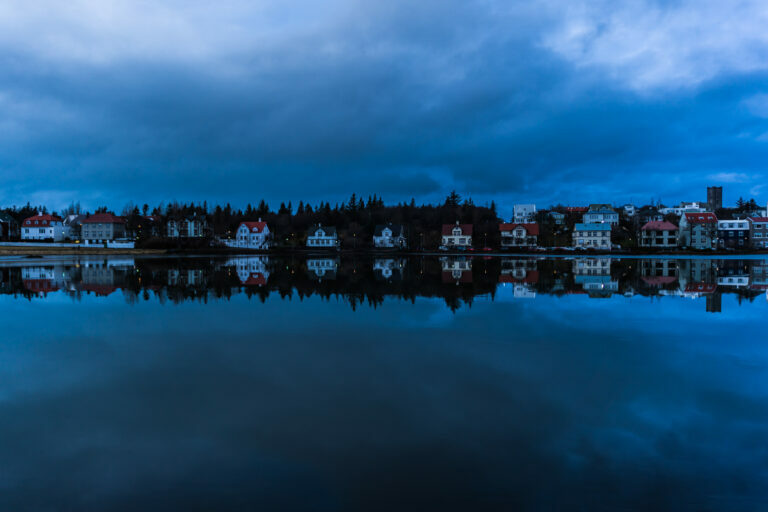 To warm up and get out of the rain going back by bus to Aurora Reykjavik: The Northern Lights Center sounds appreciated. Unfortunately it closes at 16:00 even though anouncing to have it open until 21:00. That's Christmas day. At 17:30 having dinner at Café Babalú. A tomato soup and sandwich combo, a ham & cheese sandwich and two teas for 30 EUR. The good thing: tea can be refilled as often as wanted. After trying some more different tea flavours, back to accommodation. because the pick-up for CampEasy Campervan is scheduled to arrive at 9:00. So quickly stopping at the supermarket: a sandwich and coffee for breakfast - noodle soup, beans from the can, bananas, apples and some biscuits for during the day. Total: 30 EUR. 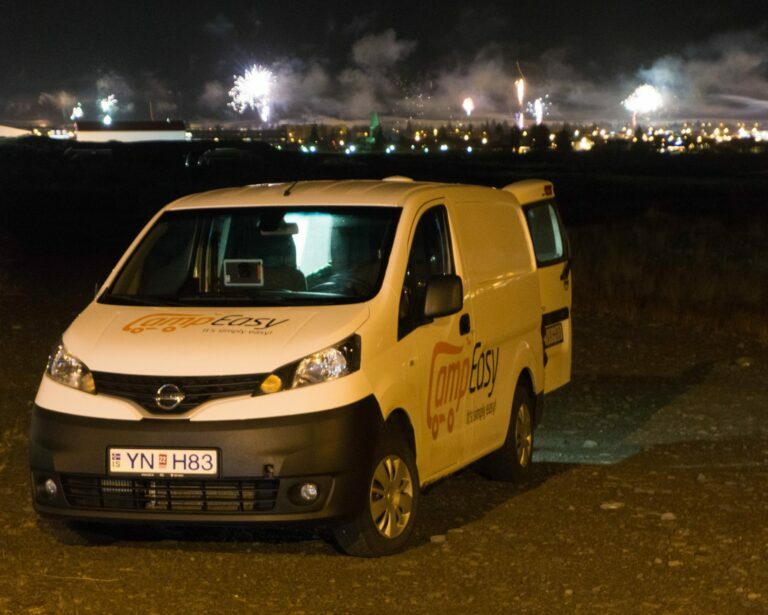 A little later the friendly guy from CampEasy picking up and driving to their head office some 10 minutes outside Reykjavik. 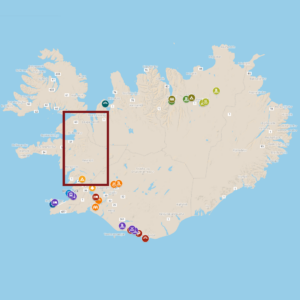 After a 45 minutes introduction and paperwork - comprehensively explained by the gentle and helpful staff - leaving Reykjavik behind and heading towards Akureyri on the motorway 1 – the Ring Road. Amazingly beautiful scenery with cloudy mountains and sea panorama. First stop at Hvitserkur, a rock formation close to the coastline. 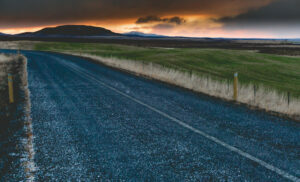 It's a 45 minutes drive on a gravel road after leaving the Ring Road. On the way there, spotting of Icelandic horses (and petting ). Having a quick soup cooked on the stove. Another 3 hours drive with occassionally heavy rain later arriving at Hamrar Campsite. It's a self service campsite operating in winter. Costs: 3.333 ISK (around 25 EUR for 2 persons, 1 camper). Dinner consists of beans with rice and noodles from the can, which are prepared at the kitchen of the self service facility. Toilets, warm water, shower and a heated dining room is offered at the location. Sleeping in the camper for the first time. super easy to set up the bed functionality from sitting position, that is used when driving and resting during the day. 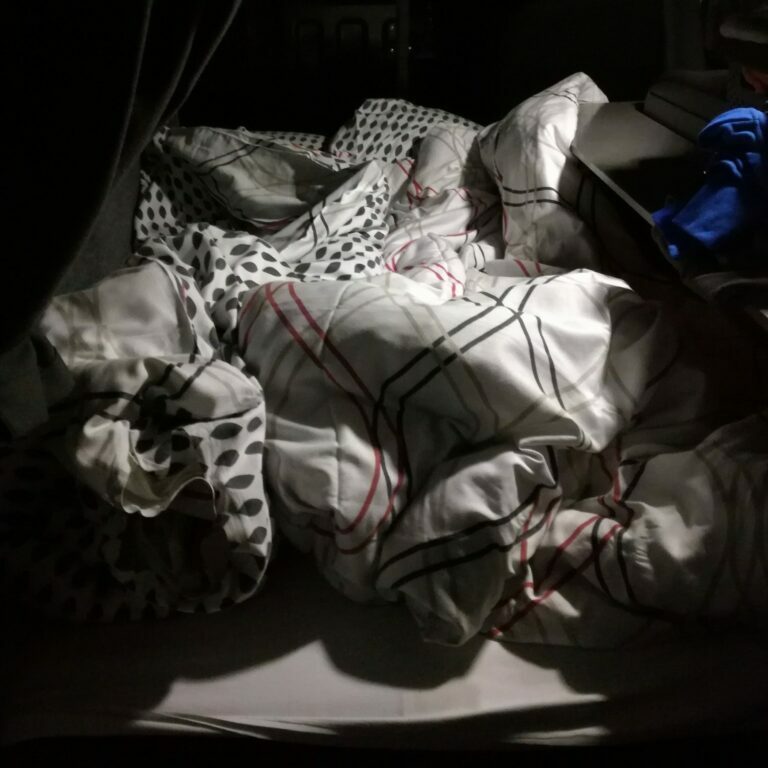 The sleeping space in the Easy Small Campervan is quite narrow considering two persons taller than 180cm. Therefore, the bigger campervan would probably fit better. However, it is still fine and the heating is warming properly all night long. On the other hand to compensate the space, it provides an active cooling box, sink unit and a working surface for eating or cooking on the gas stove. Power for the cooling box and for heating is provided by two large extra batteries, which are charged during the day's driving. 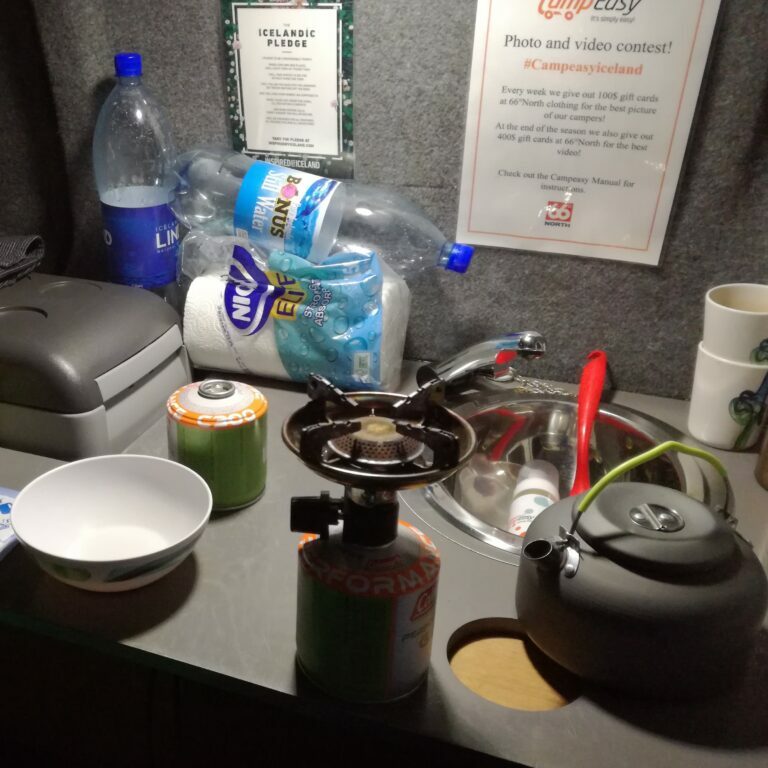 In overall, the camper comes equipped with really useful and senseful items, such as plates, cuttery, bowls, cups, cooking pot, bed linens, blankets and tools. Besides that, added extras including a stove and gas, coffee press, additional blankets, towels, inverter for power supply, GPS and WiFi. Outdoor seats, table and a BBQ grill are probably better used in the summer season. As it turns out to be a very helpful item is the tablet. 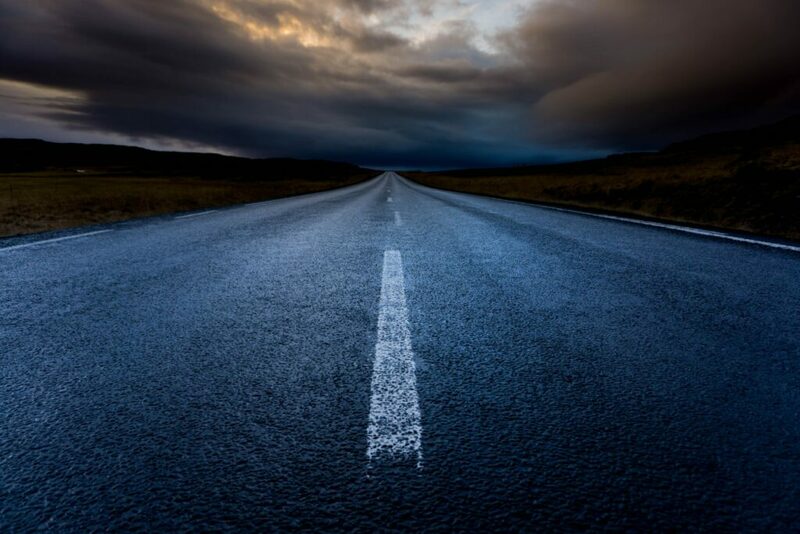 It functions as navigation system, WiFi hot spot and information source for road conditions, weather forecasts, camping locations and many more. This morning getting up at 9:00 and reverting bed to sitting function. Again easy. From the campsite in a 10 minutes drive to Akureyrakirkja for parking. Walking down to the center and having a coffee, ham & cheese bagel and a crossaint at Te&Kaffi inside Penninn Eymundsson for 20 EUR. Checking the shops at the main road and walking back on the seaside. Next stop is Bonus supermarket. 60 EUR for noodle soups, bread, salami, cereals, fruits, biscuits, milk and some other groceries. After refueling for 35 EUR going to Godafoss waterfall in a 40 minutes drive. Nice, beautiful scenery. 45 minutes later arriving at Myvatn Nature Baths. What a relaxing place! Chillin' out in the 38° degrees warm water while having a beer is just beautiful. Especially when it’s snowing outside. For 30 EUR entry and 7 EUR a beer switching between steam bath, hot tub and the „Lagoon“. At 20:00 checking in at Vogar Camping Ground and cooking noodles in the kitchen attached to the dining and bathrooms. Self-service camping for 35 EUR two persons and a camper. Going to bed at 23:00.
with cutted apples and bananas in Cherios and porrdige, leaving the campsite at 10:00. Daylight approaching. 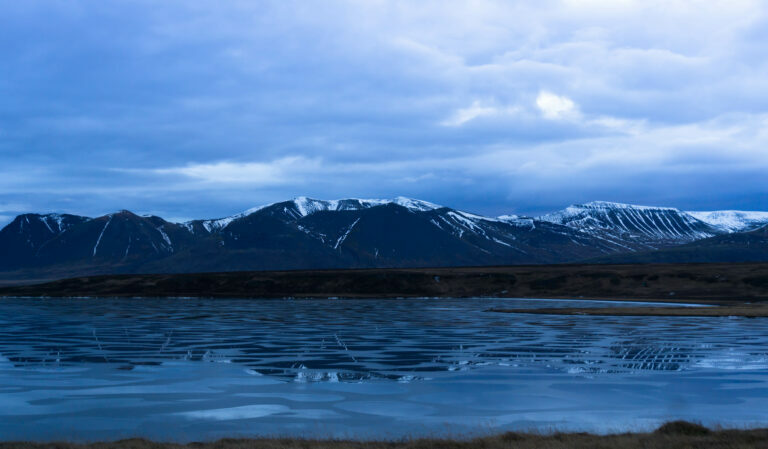 Some side stops for photo- and drone shoots later, stopping around 12:00 midday at Namaskard Hot Springs. This day the weather is clear and the sun is appearing for the first time. 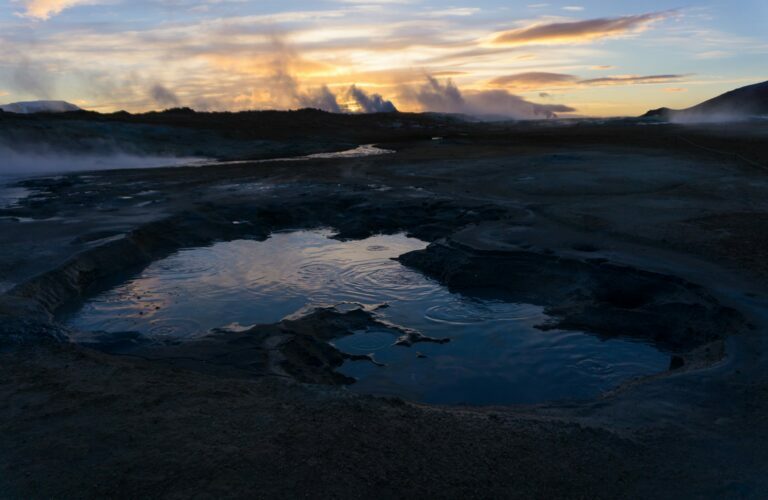 The steaming hot springs look stunning in the sunlight. Then going to Dettifoss in approximately 1 hour of driving. Very icy path to reach the panorama platform with a great view to Europe’s most powerful waterfall. After 45 minutes returning to the campervan. On the way to Lífsmótun Campsite located between Reykjahlíð and Akureyri, stopping at the Myvatn viewpoint for having a soup cooked on the stove. Outside very windy and icy. Then continuing to the campsite. Just before arriving, spotting Aurora Borealis (Northern lights) for the first time. Amazingly beautiful! The colors are even better visible on photos with a long exposure. Awesome!! Having sausages and pasta cooked in the van as dinner at Lífsmótun Campsite. This is a small campsite managed by a lovely lady from Germany who lives in Iceland for 30 years now. The place has toilet, warm shower and washing facilities attached, but no kitchen yet (it is supposed to be opened next season). That's why it is 20 EUR only for two and a van. Then again watching Northern lights and going to bed at 1:00 am. with porridge, Cherios, apples and bananas at 9:30, then driving 1.5 hours to Akureyri for refueling (70 EUR), supermarket and souvenirs at Penninn Eymundsson shop. When buying goods for more then 6.000 ISK (around 42 EUR) then it's easy to claim back taxes (14%). Shops usually provide forms with the paid amount pre-filled. Simply fill in the personal data and stop by at the tax office at Keflavik airport right before check-in. 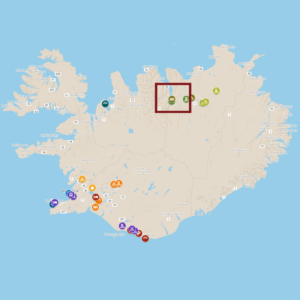 At 13:00 starting towards Thingvellir National Park with an expected travel time of 6 hours. Weather is cloudy and windy. To use the remaining daylight stopping several times for photos and drone videos on the way. Then weather suddenly changing to snowfall. 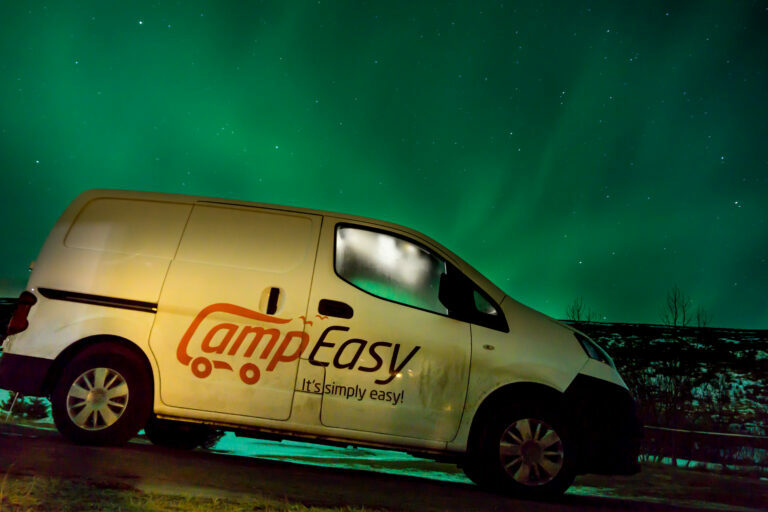 But no problem for CampEasy campervan. According to and relying on google maps, changing from Ring Road to a sideway for the fastest route. 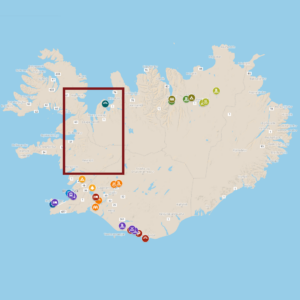 Even though it is announced 25km before, after 1 hour of driving, realizing that the final 30 minutes of the way to the Thingvellir Campsite are impassable. So going back and checking for an alternative. 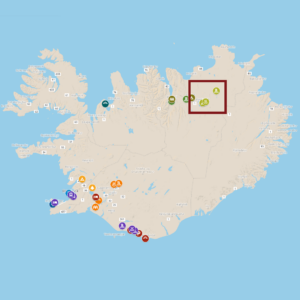 That turns out to be the Bjarteyjarsandur Campsite. Again no other guests. 25 EUR for warm water, a washing room and no kitchen is slightly more expensive than the day before. Especially, when considering the drunken lady, who opens the washing facilities. Anyway, sleeping in the camper as usual around midnight. full day of raining starts at 10:00 morning. Skipping breakfast and keeping the bed function for the moment. After a 20 minutes drive stopping at a small parking on the south side of Hvalfjordur. Catching up breakfast with every days apples and bananas in a bowl of Cherios with milk and coffee afterwards. After another 30 minutes of constantly driving in rain, arriving at the visitor center of Thingvellir National Park. When entering the parking lot, the campervan's number plate will be recorded and a 7 EUR parking fee (valid full day for all parking lots at the park) is obliged to be paid at one of the self-service terminals inside. From the outer terrace having an overview of the park. Still heavy raining. So, reducing outside activities and going down by campervan to a closer parking lot. In a 15 minutes walk to Öxarárfoss waterfall and Thingvellir church. Completely soaked, back to the van. Approximately 40 minutes drive later arriving at Hotel Borealis. What a welcoming place for warming up after a full day of rain! Best timing for a two days stay in a comfortable Hotel. It is almost 300 EUR for two nights double room including breakfast. That cozy room with private shower, hot tub and Aurora Borealis wake up service is worth for staying over New Year’s Eve. Reserving the New Year’s Eve buffet at the restaurant and relaxing in the hot tub. waking up by the clock alarm at 9:15. The Hotel's breakfast consists of toasted bread with ham and cheese, boiled eggs, meat balls with sausages and orange juice. Finishing up with fruits, little croissants and coffee (that tastes more like water - However, comparing to the usual Cherios it's more than a welcoming change). Outside heavy wind. 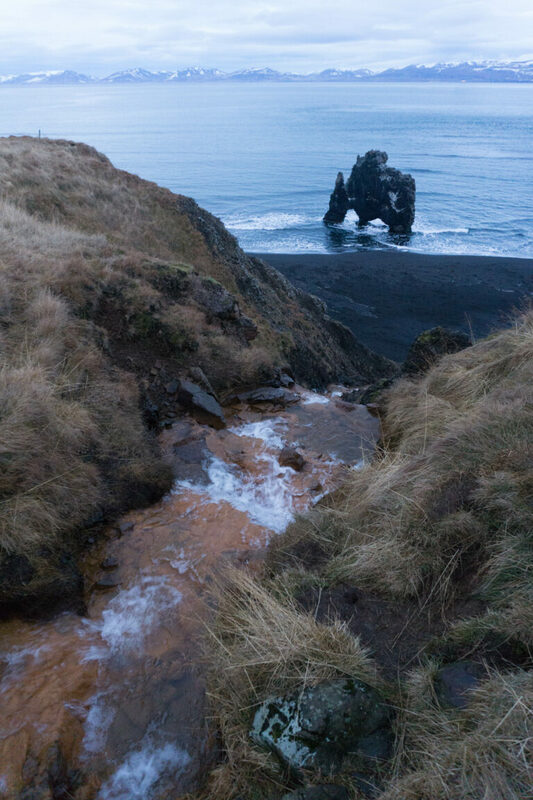 Starting at 10:15 to the famous hot spring Geyser in the geothermal area of Haukadalur Valley. During the 45 minutes drive the campervan stays stable considering the windy and snowy conditions. Stopping for refueling (approximately 55 EUR) and arriving a little later. It's unpleasantly cold waiting for the Geyser to erupt. Regardless icy wind and temperatures tons of tourists watching the geysers. 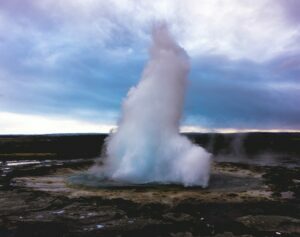 The smaller geyser Strokkur erupts several times, but the big one seems to be inactive this day. Still amazing. Then continuing to Gullfoss waterfall in a 15 minutes drive. 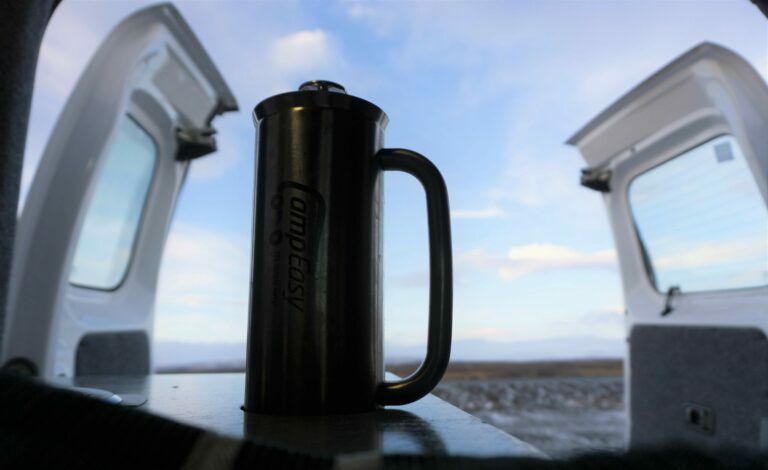 Quickly having coffee and tea brewed on the camping stove. Again windy, but the sun decides to appear for the rest of the day. 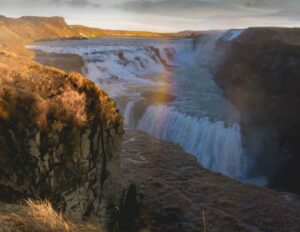 The amazing scenery with a rainbow reflecting in the powerful waterfall is worth the literally thousand tourists. That is, of course, exaggerated but must be even more in summer. 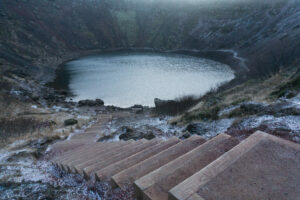 Just before sunset arriving 30 minutes later at Kerid crater lake. 3 EUR per person entry fee. Walking around and down the crater, before going back to the Hotel for warming up in the hot tub. Just beautiful. 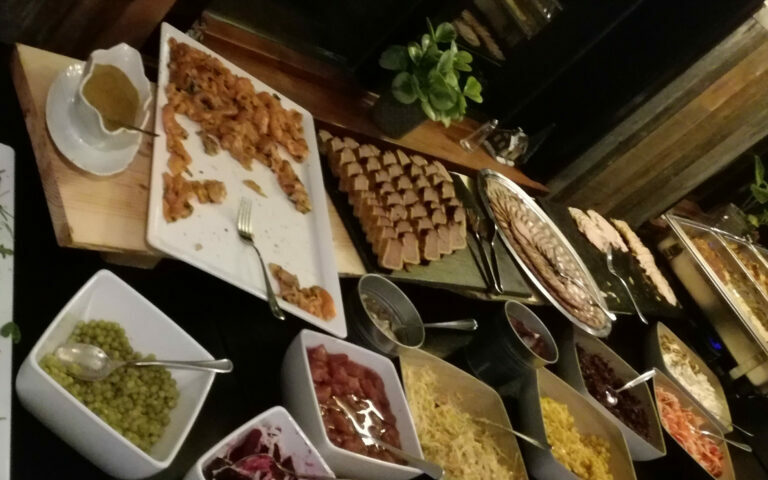 At 19:30 having New Year’s Eve buffet. Nicely arranged. Starting with salmon, herring, red turnips and salads, followed by the main dishes of potato gratin, turkey, lamb, meatballs and vegetables and as dessert two sorts of chocolate cakes. The price of bit more than 50 EUR per person also includes water and different kind of teas. That is just fair. 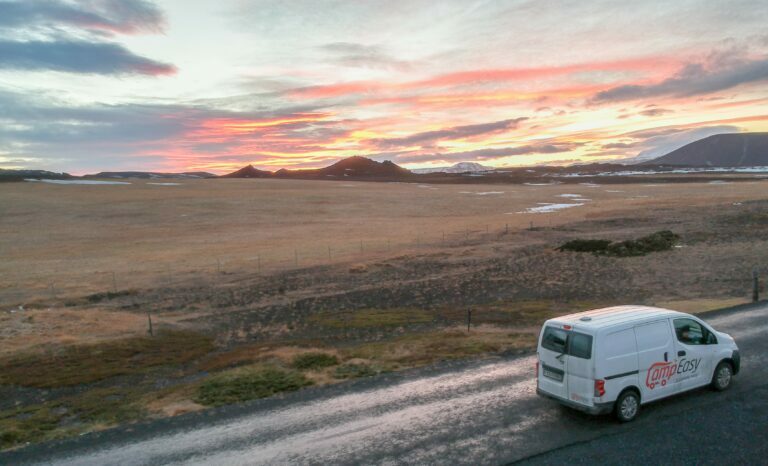 Then going to Selfoss city for watching the fireworks from the back seat of the warmed and cozy campervan with a perfect view on a little hill above the city. Amazing. Before returning to the Hotel at 2:00 am, small photo shooting with Northern lights background. 9:15 getting up and having breakfast. 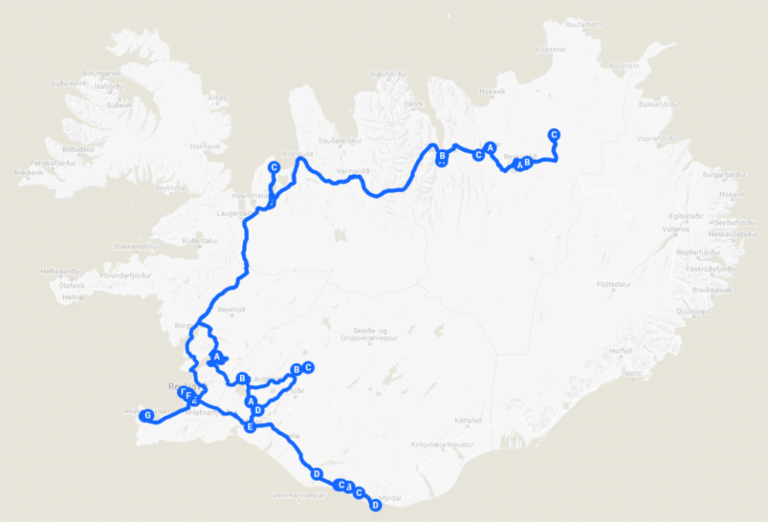 After check out going to the Eyjafjallajökull viewpoint with some drone and photo side stops on the way in a 1.5 hours drive. 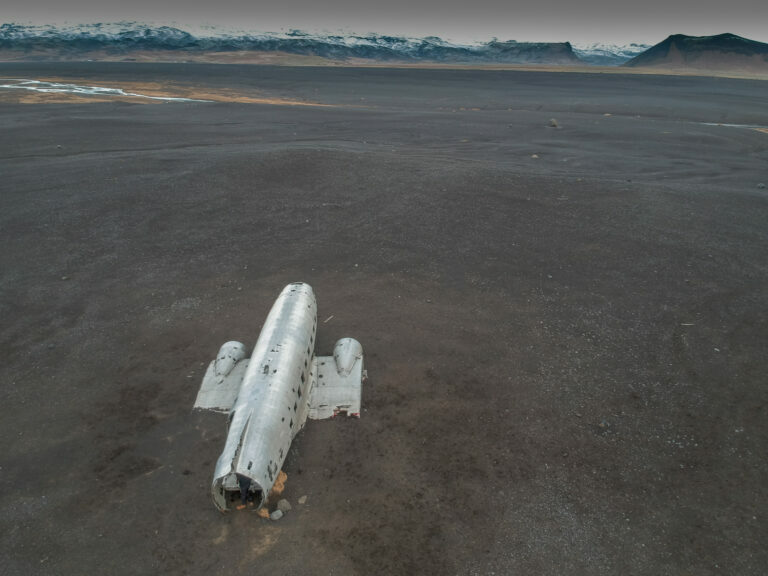 From there in another 20 minutes drive to Solheimasandur Plane Wreck parking. 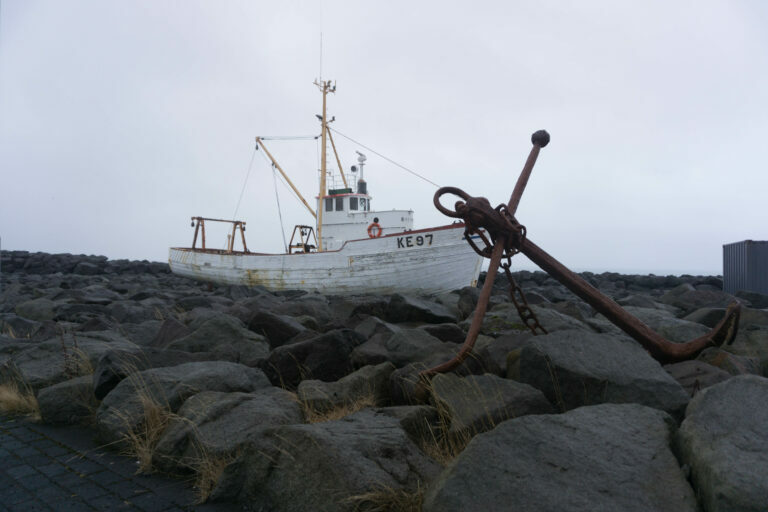 The wreck itself is accessible in about 45 - 60 minuntes walk in one direction. Some more drone shots later, going back the same way to the camper. 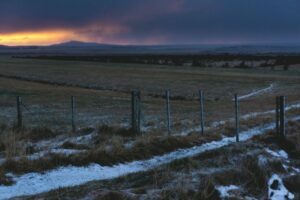 Before it's getting dark driving to Reynisdrangar viewpoint from Dyrhólaey side. 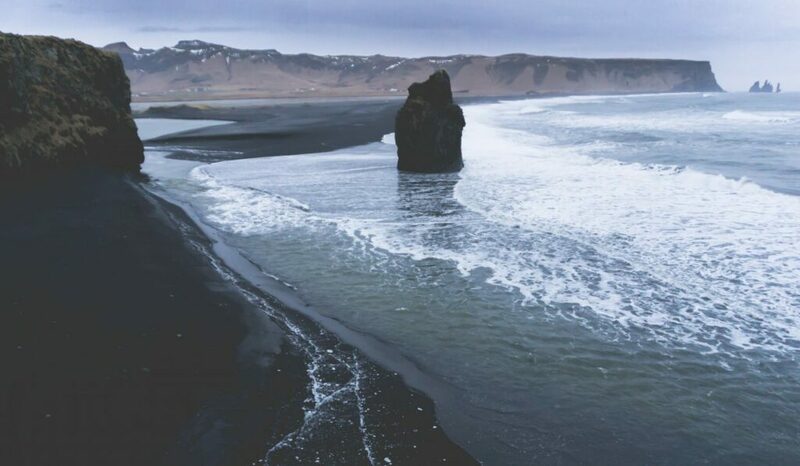 Beautiful black lava sand beaches. Cooking couscous with beans in the camper before going to Skógar Campsite in 25 minutes and arriving at 18:00. The campsite itself has only very basic facilities and no kitchen. On the plus side, the responsible lady comes to the camper for collecting the 20 EUR camping fee, which can be immediately paid by card! As it slightly starts to rain finishing this day inside the camper while having chocolate and tea. 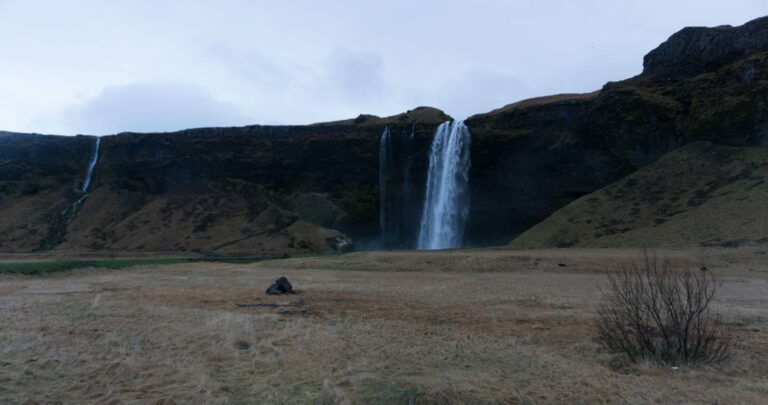 around 10:00 with the calmful noice of huge Skogafoss waterfall in the background. After breakfast quickly going to the base of the waterfall. Amazingly close approaching. 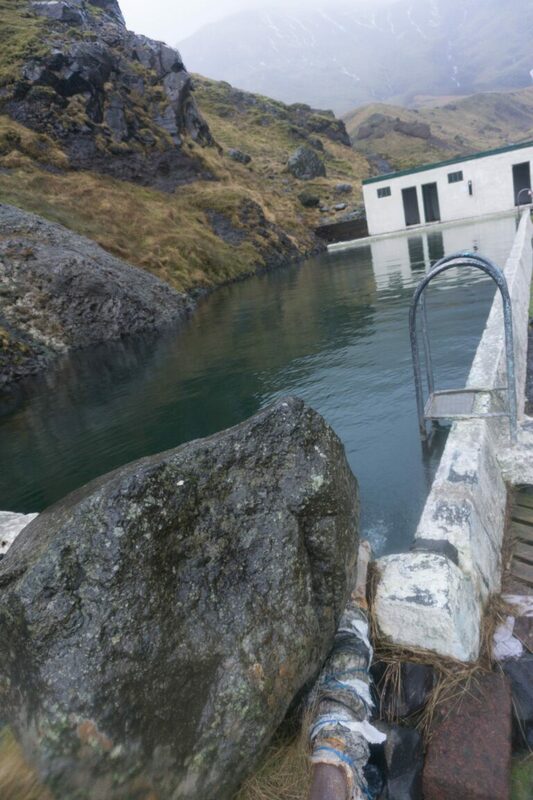 Then driving in 10 minutes to the closest parking possibility to Seljavallalaug swimming pool. 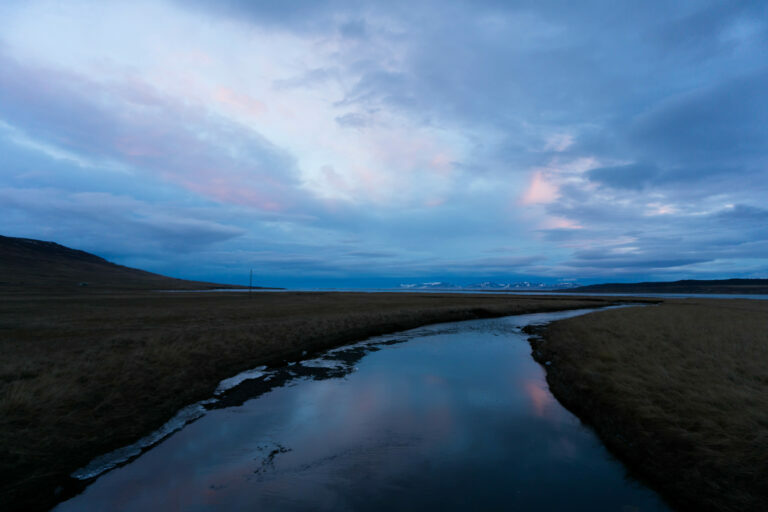 It is an approximately 30 minutes walk along the river to get to one of the oldest still standing swimming pools in Iceland. This medium-warm water outdoor pool makes it a short stay inside, but it is stunningly beautiful located in the nature. Better skip the changing room facilities, which are definitely not inviting. Then returning back to the camper and starting the approximately 2 hours driving time to CampEasy office. 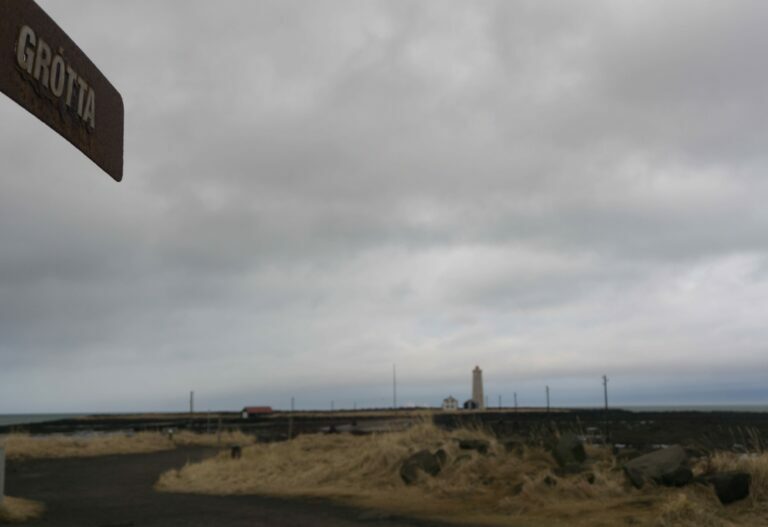 On the way stopping at Seljalandsfoss waterfall (5 EUR parking fee) and later at a sideroad for cooking the last time. Maccaroni and cheese. 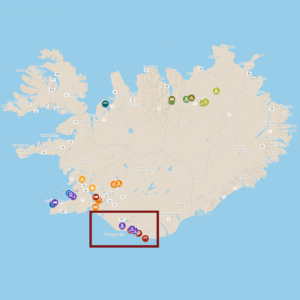 A free taxi to the Reykjavik Bus Terminal and from there with the public bus number 55 for 15 EUR per person in 1 hour to Keflavik city, Hotel Berg. That's a really luxury hotel with rooftop pool and view to the harbour. Later having dinner just on the other side of the harbour at Kaffi Duus restaurant. Shark and brennivin schnapps as a starter, followed by the maindishes panfried fish in coconut crumbs with garlic-roasted shrimps together with rice and vegetables and the Sailor's plate: mixed types of seafood spiced and boiled in white wine, served with mixed vegetables an potatoes topped of with garlic-roasted shrimps and sauce. As the shark is depending on personal taste, the maindishes are extraordinarily delicious! 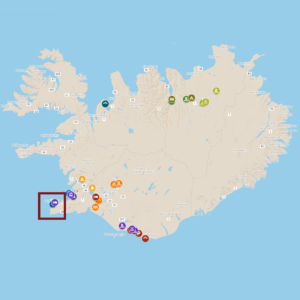 It's just confirming that the Icelandic cuisine's speciality is all about seafood and fish. Together with a dark Tuborg beer and a Pepsi the 80 EUR in total are definitely worth it. After relaxing in the rooftop pool with 40 degrees Celsius going to bed at midnight. After check out having a little walk to Keflavik city center and spending the last cash for some snacks at the Bonus supermarket. Returning to the hotel and spending the time in the nice lobby and at the pool until airport shuttle pick-up at 18:00. At the airport tax refund office, requesting for claiming back taxes, which will be transferred to the declared credit card. Flying out of Keflavik airport at 20:00. 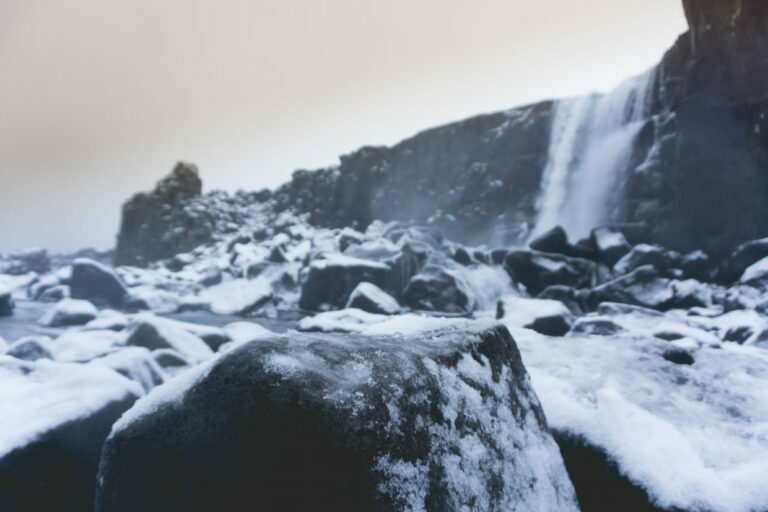 Glad to hear that 🙂 I can only recommend travelling Iceland! I can think that this itinerary described above with little adaptions can also be done in seven days. However, keep in mind that weather conditions may force you changing your plans. We had quite good weather considering winter season and still some days were full of activities for best use of daylight. My spouse and I stumbled over herde by a different web address and thought I may as well check things out. Thanks for that, i really would like to visit your place in Orlando once! Way cool Rainer. 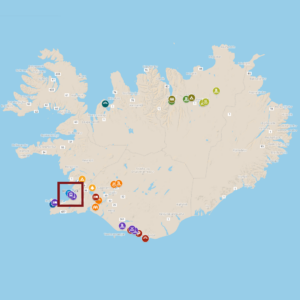 I did a quick Iceland layover about 2 weeks prior to your trip. Amazing how the sun rose at 11:30 AM then, and set at 3:30 PM. 4 hours of daylight. Yikes LOL. Fully agree on that. Using the remaining 4h of daylight to most benefit from it. Thanks Ryan K Biddulph!